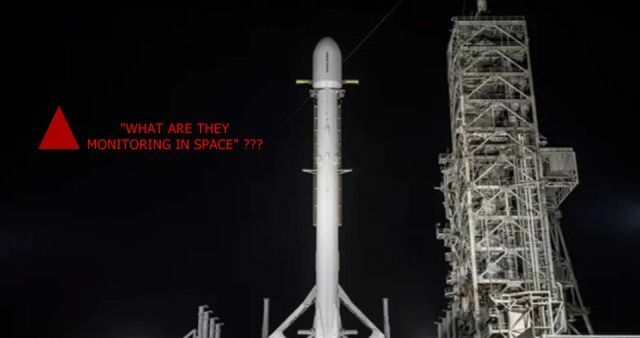 SpaceX to launch Top-Secret “Zuma” Satellite this Friday - What are they monitoring in Space? As we have reported, from December 22 to December 26, 2017 four superpower Nations; US (SpaceX), Russia, Japan and China have carried out rocket/missile launches, all carrying satellites and on January 1, 2018 the NASA HD camera on board the International Space Station recorded a cigar-shaped object at the moment it is leaving the atmosphere. Yet another SpaceX Falcon 9 rocket is scheduled to launch these week! The mysterious Zuma payload sits atop a SpaceX Falcon 9 rocket at Kennedy Space Center's Launch Pad 39A. Credit: SpaceX/Space.com. The liftoff which was originally planned for mid-November is now scheduled for January 5, 2018 between 8 p.m. and 10 p.m. EDT Friday (Jan. 5; 0100 to 0300 GMT Jan. 6) from NASA's Kennedy Space Center (KSC) in Florida, according to Space.com. The payload which sits atop the Falcon 9 rocket is a top-secret government satellite named Zuma and built by defense contractor Northrop Grumman. The Zuma mission only became public in October, when NASASpaceflight.com reported on documents that SpaceX had filed with the Federal Communications Commission, requesting authorization for a mysterious “Mission 1390" reports TheVerge.com. Northrop Grumman has confirmed that it procured Zuma's launch atop a SpaceX Falcon 9 rocket for the U.S. government but has not released any further information on the spacecraft except that the Falcon 9 will deliver Zuma to low-Earth orbit, a range of altitudes that extends up to about 2,000 kilometers above the planet, reports Space.com. So far, it's unclear which agency is in charge of the Zuma project and the NRO, (National Reconnaissance Office) which usually announces the launches of its spy spacecraft, said that Zuma doesn’t belong to the agency, according to TheVerge.com.